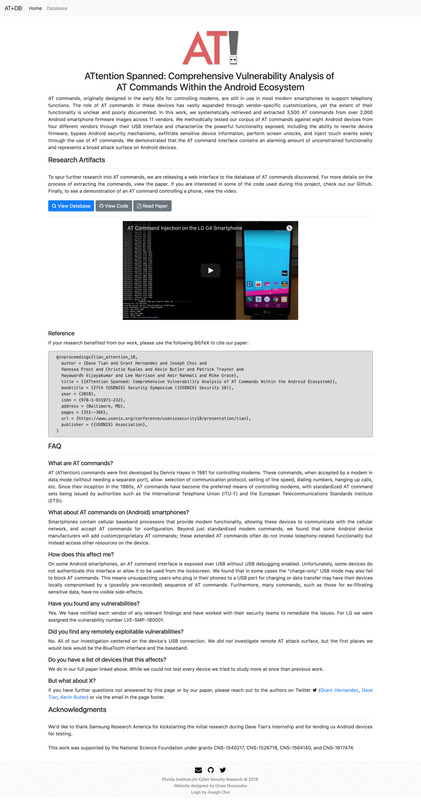 I designed a landing page and a NodeJS/MySQL powered database for a research paper. The landing page was purely informational, but the database incorporated autocompleted search and different views of the data. This project greatly improved my Gulp skills and I learned about the joy of developing using BrowerSync. I created a landing page for SwampCTF, a student run Capture the Flag competition hosted by the University of Florida Student InfoSec Team. 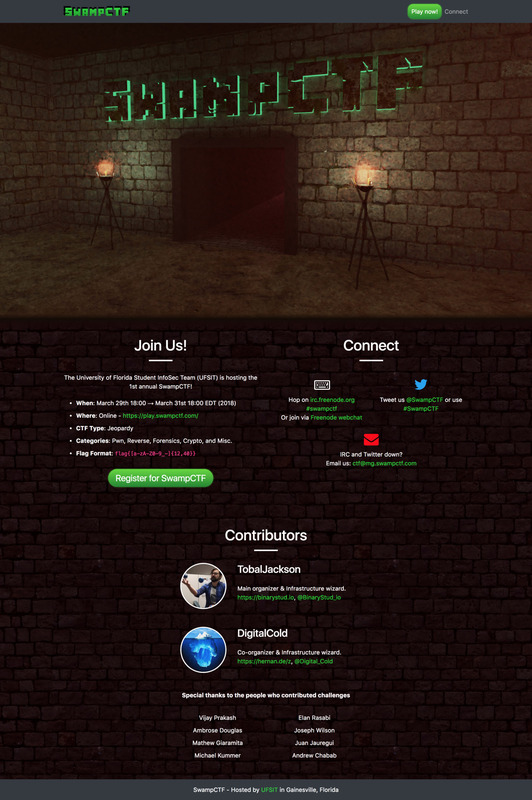 The site hero was a Blender rendering I made to set the mood for the Dungeon’s & Dragons themed competition. The rest of the landing page was made using standard Bootstrap classes. The dynamic game site was deployed on top of CTFd, which included nginx, Gunicorn, MySQL, and Redis for session caching. All of this was deployed on two AWS servers. 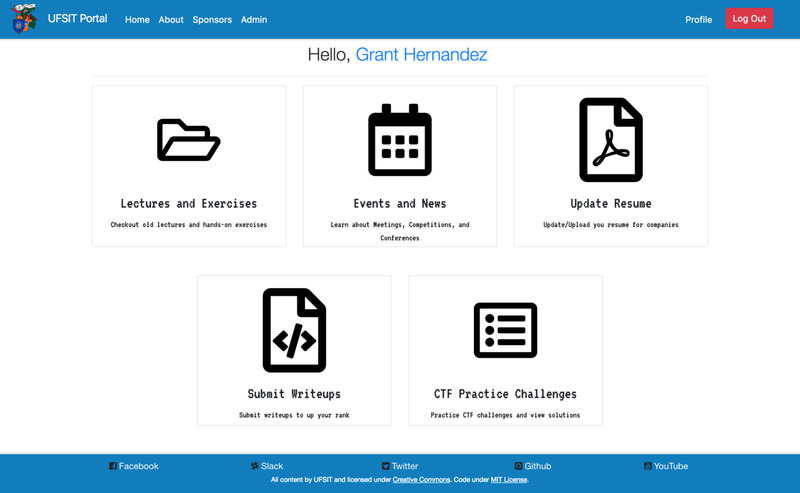 To help streamline lectures, events, and to collect member attendance, I worked with UF SIT, a student-run security club to create a student portal. The portal today gives members a unique signin to help track their attendance and attribute writeups. Before this, the club was using a single Google Forms sheet which was fraught with inconsistencies, such as misspelled names, and had little to no actionable data or metadata. We were fed up with the current system and in 2017 the club decided to move forward with a portal as a “year goal”. By the end of the year I helped create the backend using NodeJS and MySQL with an AngularJS frontend. We began slowly rolling out and testing the site during meetings. By the end of May 2018, an independent student team completely redesigned the frontend using Angular 5 and added many additional features. I take most of the credit for laying the backend foundation and I plan on continuing to manage and maintain the website for as long as I am a student at UF. As the final artifact for my undergraduate senior design project, I created a single page website summarizing and documenting our work for future seniors. 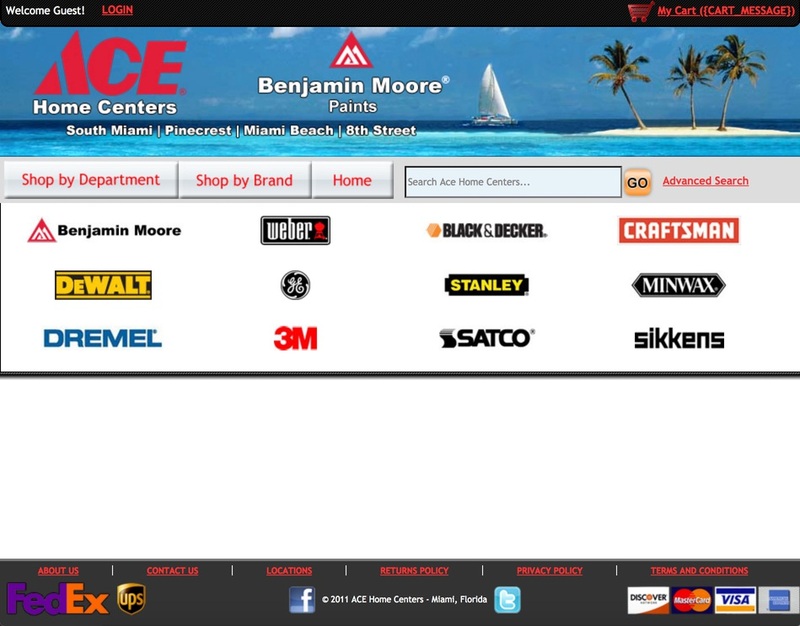 My first summer job back in High School was working at a local ACE Hardware, except instead of helping customers on the floor or taking inventory, I was developing the website for their three local stores. I worked their three consecutive summers, improving the site more each time I returned. I learned a lot about what I knew and didn’t know about web design and had a tough time fighting against the completely closed-source PHP backend, Activant iNet. I was forced to write C++ “scripts” to auto-generate and upload custom pages via the admin panel due to the lack of source code. In the end, I made our site look better than every other cookie-cutter iNet site out there and usable enough for customers to make purchases online. The first website I ever made after receiving my "Junior Webmaster" certification back in middle school. It essentially consisted of stolen flash games, animated falling rain, and a whole lot of snark – all crammed into absolutely positioned divs. It’s a shame I don’t have a screenshot…then again, maybe it’s for the best.